Lessons are always hands-on, interactive, and conducted in our beautiful 254-acre open-air classroom. 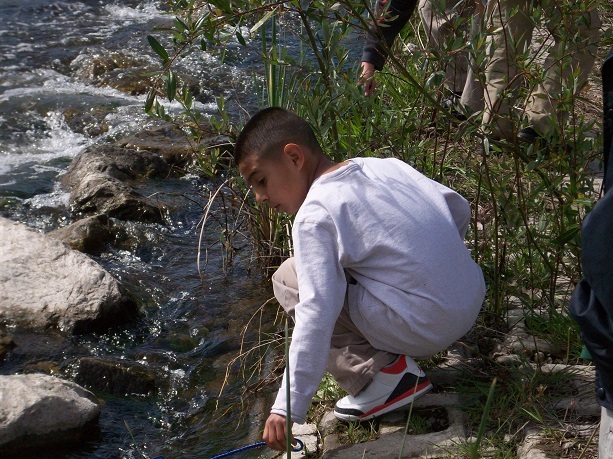 Programs are centered on the natural and cultural history of San Jose; protecting the Guadalupe Watershed; and cultivating awareness, fitness, and creativity within our natural world. for Title I schools and special needs groups! Taught by Bay Area experts, explore a variety of topics such as composting, grey-water basics, photography, flower arranging or wreath making. You can even practice yoga, take a guided hike or bike tour. Check back with us often to see what’s new! Our organization is committed to providing fun opportunities for environmental family learning. Our engaging topics vary from birding and guided walks, to painting in our Heritage Rose Garden. Age restrictions may apply. Check back with us often to see what’s new! 300 fifth grade students make for a lively, educational festival celebrating the South Bay watershed. We love college students passionate about the environment and education! Many students from San Jose State, Santa Clara University and West Valley College have completed internships with us for college credit. Contact us for more information. Discover lifecycles of salmon and trout, geocaching, the history of Santa Clara Valley and San Jose, archaeology, flower anatomy and pollination, composting and vermiculture (that’s worms!). School field trip programs meet California State Education Standards. Scholarships available for program and transportation. Monthly series for homeschool students learning natural science topics. Offered on Monday and Thursday afternoons. Outdoor explorations tailored for those with special needs. This program is an early introduction into environmental science. Designed for children age 3-6 years old, this FREE program is taught by Guadalupe River Park Conservancy environmental educators. Topics include rivers, frogs, birds, and more! We now offer two classes: one in English, and one in Spanish. $300 for transportation to eligible Title I schools, and Special Needs groups. Classes and Programs meet at the Guadalupe River Park & Gardens Visitor & Education Center at 438 Coleman Avenue. So that we can maintain appropriate student to teacher ratios and sufficient materials, 24-hour advance registration IS required. The GRPC Education Department is looking for an independent, hardworking individual to create and implement top-notch environmental lessons to our homeschool students. This program is NEW and we are looking for someone who is creative, flexible, and detail-oriented. Guadalupe River Park Conservancy is seeking a student intern to provide support for early childhood educational programming. Early Childhood Education Interns are integral in providing high-quality, hands-on science programming to the park’s youngest visitors. Managing groups of 10-20 students at a time, either individually or with a teaching partner. Under the direct supervision of GRPC staff, Guadalupe guides assist with the implementation of education programs. These programs include: field trips, homeschool classes, adult education programs, and education events. Guides will set up, clean up, and teach environmental science and place-based lessons. They will assist with materials preparation for events and education programs, and perform other projects and duties as they are assigned according to the interest and abilities of the Guide. We are looking for a passionate, positive, and enthusiastic individual to join our dynamic and fun work environment. We need someone who is self-directed and can work independently as well as in a group. Guides must be able to teach in the variable outdoor environment. $13.50/hour, with a variable schedule. Field trip season peaks in the fall and spring with limited hours available during the winter and summer. After successful completion and review of the first season Guadalupe Guides will be considered for a pay increase to $16/hour.